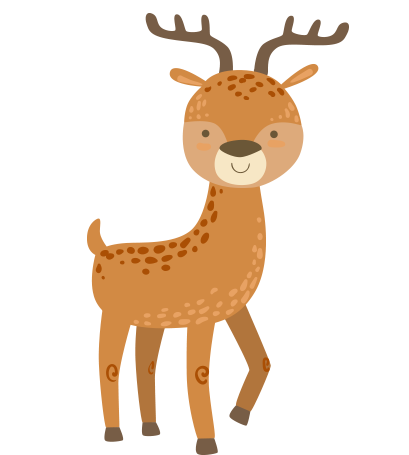 Deer lose their antlers and grow new ones every year. The male is known as a HART/STAG, the female is known as a HIND and a baby is known as a CALF. A group is known as a HERD. The red deer is Britain’s largest land mammal. Red deer are red-coloured in summer. This changes to greyish brown in winter. Harts are easily identified by their large antlers. Antlers are highly branched. The number of branches increases with age. Up to 16 points in native animals. The angle between the brow tine and the main beam is always more than 90. This is important in distinguishing red deer from the related Sika. Harts roar and grunt during the rut. Hinds bark when alarmed and moo when searching for their young. ORIGIN: Inhabits most of Europe, western Asia and north West Africa. LONGEVITY: May live over 20 years. WEIGHT: 160 - to 240 kilos. SIZE: Can be 150 – 190cm tall. DIET: Red deer are herbivores and graze a wide variety of plants from grasses and heather to shrubs and trees. 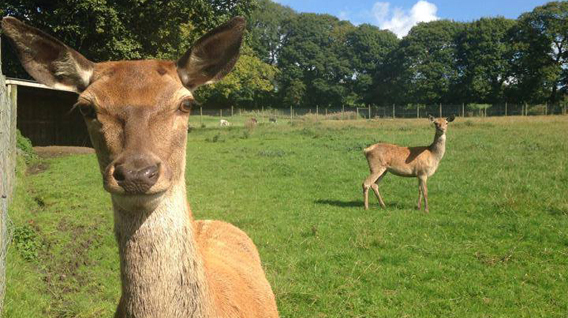 GESTATION: Woodland red deer can breed at 16 months old. The mating season, known as the rut, begins in mid September and continues to late October. Hinds normally give birth to single calves from late May to June. Twins are sometimes born, but they are extremely rare.